A few months ago I was contacted by French children's sewing pattern brand Ikatee and asked if I'd like to pick a pattern to try for free, in exchange for a review. Who doesn't love a free thing?! I know I do, especially when those 'things' are gorgeous children's sewing patterns. I hadn't heard of the brand before and it was a lot of fun, if mildly stressful, choosing which to go for. If I'd been given free rein, I would have gone for the Hibiscus ruffle blouse, which is similar to many of the garments I've pinned here. 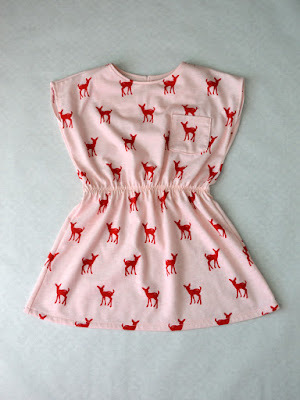 In fact, I'm pretty obsessed with ruffles for both girl's and women's wear at the moment. Anyways, I asked Dolores her opinion and she chose the Corfou dress pattern, which really surprised me as there were plenty more 'dressy' dress patterns to choose from. I was doubly surprised in fact because the website shows the pattern made up in a blue and white striped fabric, and as Dolores is very quick to tell me, she doesn't like blue (she has yet to work out that a garment could be made in different colours than is shown in the photo and isn't interested in me trying to explain that to her). 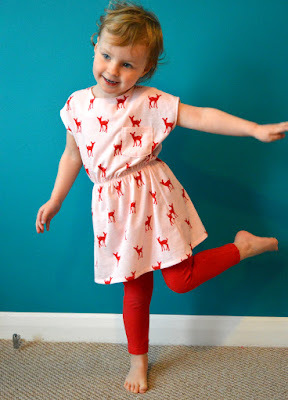 However, I was very pleased because the Corfou dress pattern (which includes sizes 3 to 8) looked like a great canvas for lots of different fabrics, and being a pattern designed for knit, I hoped it would be comfy and offer lots of freedom of movement. Using the pattern was really interesting. Despite specifying that it be made in knit fabric (like this printed jersey), the construction steps feel more like working with a woven. For example, there is a neck facing and a button back fastening. Plus, you are required to topstitch round the neckline and keyhole. 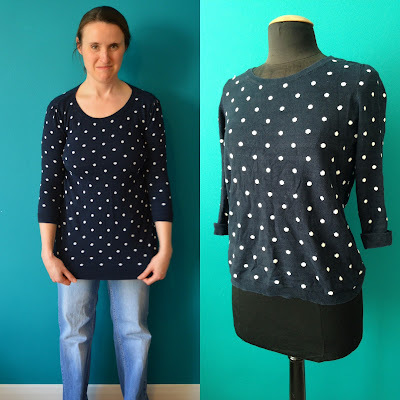 The only part that really made it feel like a knit pattern to me was the small seam allowance and using my overlocker to stitch the shoulder and side seams. But I found the English translation of French instructions really charming, and the step-by-step photos were clear and helpful. Something else that I found unusual with this pattern was that each size is a separate PDF document, rather than having all the sizes grouped together in one. This isn't a problem as such, and in fact many may prefer it as you don't have have all those confusing lines overlapping each other. But I think if they'd all been grouped together then my tired brain might have remembered to cut the size larger for the length! The second freebie element of this project was the fabric. 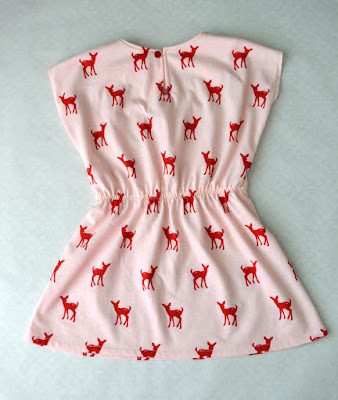 I'd been eyeing this fawn print jersey on the Girl Charlee UK website for ages. Then at Christmas I saw that Just Sew Jenna had made some fabulous pyjamas for her daughter in this different pink and red colour way and my WANT alarm went off. Dolores loves pink, I love red; finally a fabric we can both stand. 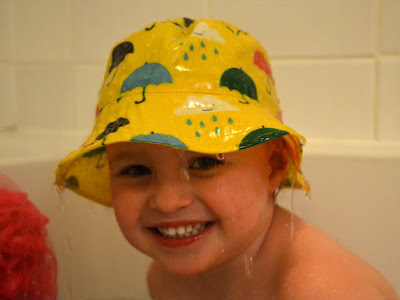 One cheeky email later, and Girl Charlee agreed to send me a metre or so for free. Thanks Mark! This jersey is a cotton and polyester blend, with a light to medium weight and decent stretch. However, I'd also describe this fabric as having a bit of body to it, which lends it perfectly to this pattern as it helps keep the shape of the little kimono sleeves and A-line skirt. 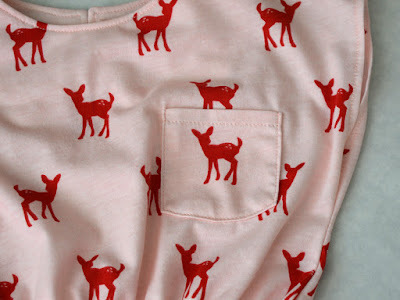 I also love how the deer get a bit distorted where the elastic brings the waist in. I could have pattern-matched when cutting the pocket, but I wanted to make the pocket slightly more visible by selecting one central deer that would be offset from the background instead. This has got to be one of my very favourite makes for Dolores to date! It's so cute and casual and sassy. The size 3 of the pattern ended up being a touch short, so it's unlikely that she'll wear it without these hand-me-down red leggings underneath, but she's fairly tall for her age. I think that the pairing of pattern and fabric is one of my best, if I may toot my own horn. However, I'm tempted to add a larger seam allowance and try the pattern in a woven fabric next time, a cotton lawn perhaps, to see how that turns out. 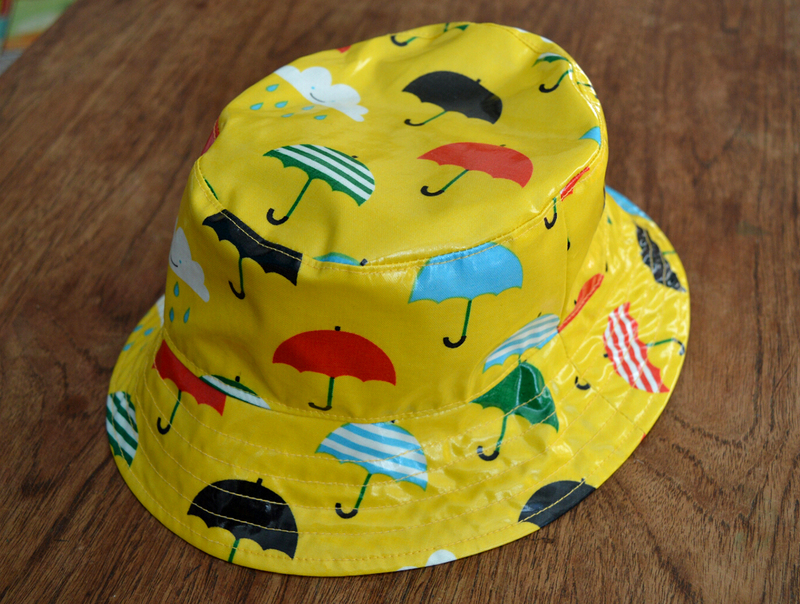 Perhaps a solid colour with a contrasting printed pocket? 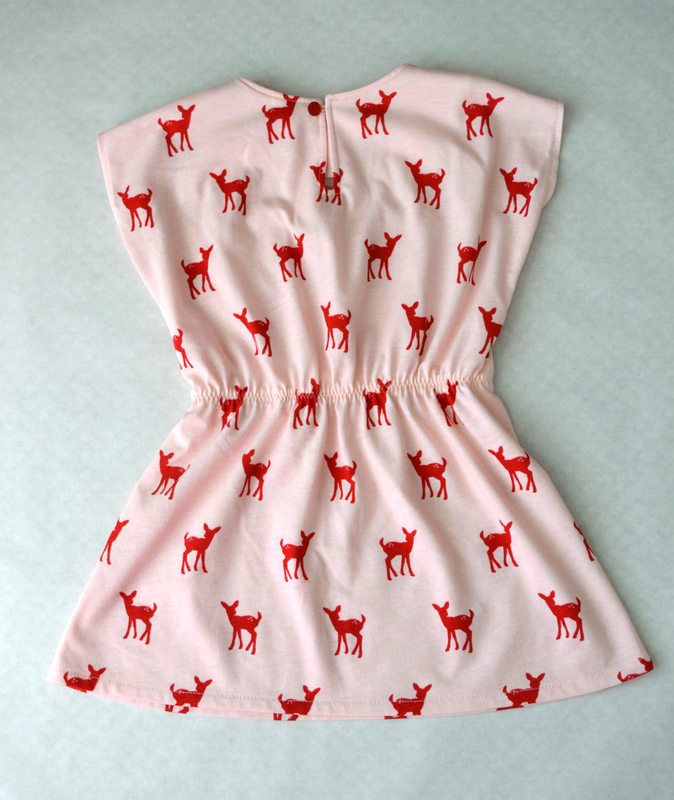 This pattern requires very little fabric, so I'm also thinking up some plans to use the rest of this lovely fawn jersey too. My theory is this: sometimes you sew something predominantly because you've had a great idea for a project, and other times you sew something predominantly because you actually really need the item. Like, you need it now. And the need for a specific item always seems to come when you're short on time, doesn't it? I usually find that refashioning and remaking existing garments is a good way to get what you need quicker than starting with a piece of pure, unadulterated fabric. I also get a massive buzz from creating something that will see heaps of wear from a garment that already had a previous life. Here are five things I've made over the last few months that begun life as a different garment. 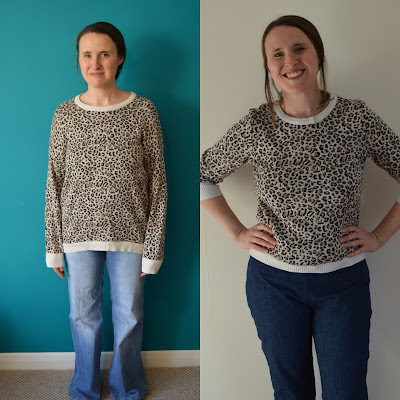 The photo at the top of this post is proof that the jumper remake pictured above has gone into immediate wardrobe rotation. At the start of each winter I am swiftly reminded that, for someone who lives in the UK, I really should own more warm tops. I am committed to and passionate about making as many of my own clothes as possible, but I'm not a knitter so it can be hard to fill this particular gap. So when I saw this rather shapeless leopard print Topshop jumper in a charity shop, I thought BINGO! Using a self-drafted sweatshirt pattern as a starting point, I recut and reconstructed this jumper using my overlocker into something much closer to the fit that I prefer. As the knit is looser than sweatshirt fabric, I ended up 'carving away' at the side and sleeve seams until I got the fit I was looking for. Obviously, drafting the sweatshirt pattern took me some time a few years ago (thanks past-Zoe), but aside from that, this project took about an hour. It's hard to tell in the above photo but this fine knit navy and white polka dot jumper was a maternity item. I didn't get to wear it in my last pregnancy because it was summer when I was at my largest. Like the leopard jumper, I was able to retain the original neckline. However, unlike the leopard jumper, the shoulders and sleeves of this one already fit me well. Therefore it was a quicker remake, taking perhaps 20mins in total to get the length and shape I was after. 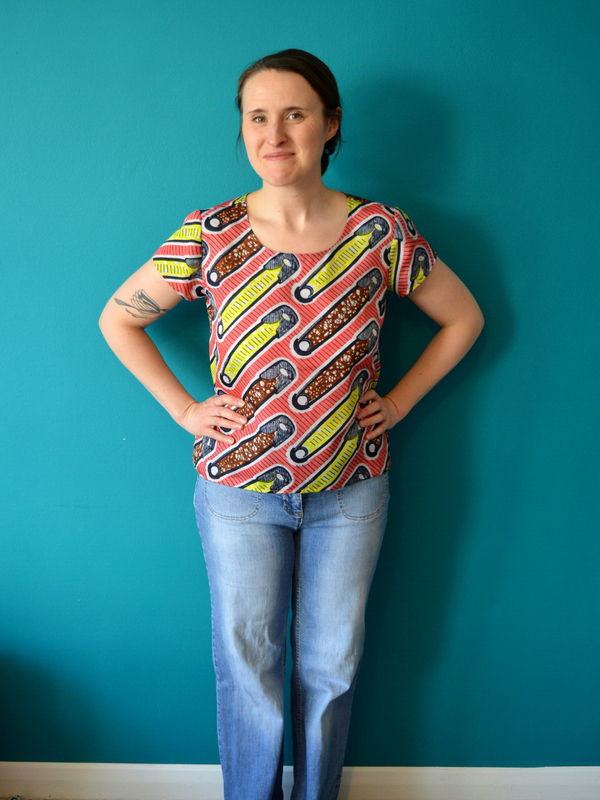 I made this Peter Pan batwing top during my first pregnancy and wore it heaps during both. I could have nipped it in at the side seams for post-pregnancy use, but that statement oversized collar isn't really my bag any more. 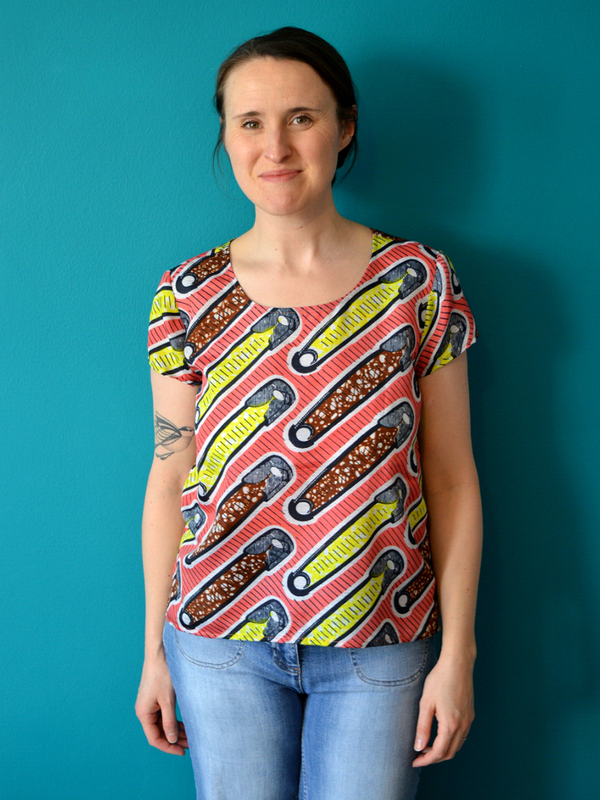 Plus, I was getting pretty desperate for some vests to keep my belly covered when I yank up my tops to breastfeed, so I decided to rework the batwing top using my free vest pattern instead. Reusing a well-worn top for an under vest had the added benefit that the fabric is already really soft from lots of wear and laundering. I added a twist to the basic vest pattern by pinching and then stitching over a section at the centre. It's created a pleasing sweetheart neckline and a cool graphic effect thanks to the bold stripes. Dolores has outgrown the smaller and less stretchy of the clutch of vests I made for her this time last year. What is up with that?! You think you've nailed your kid's particular lack of clothing or shoes crisis and then they go and get bigger all over again! Well I found this horrendously Barbie-pink T-shirt in my stash of refashionable garments, with absolutely no idea where I came from, and I knew it would be just the shade to appeal to my little girl. When recutting I had to choose to include the existing hem or the button detail. I went with the latter but didn't do it very effectively, so sadly only one of the original buttons got saved. The turquoise FOE and iron-on diamante heart kind of steal your attention away anyway. Since deciding that the only skirts I'm interested in wearing are a basic knit pencil style, I made a black and white striped one, a solid navy one, a faux denim one, a solid black one and a spotty one. 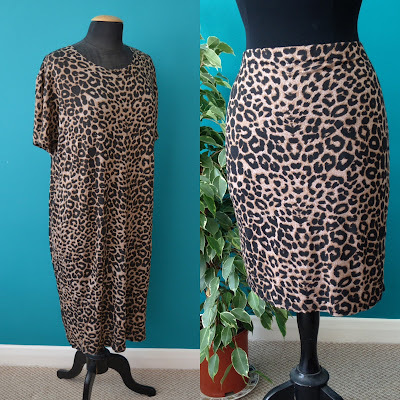 The only thing missing, as far as I could tell, would be a leopard print one (I'm pretty convinced that leopard print can be classed as a neutral!). After making all these knit skirts, I've tweaked the pattern so that I'm really happy with the fit, so I've been scouring the charity shops for a leopard print skirt or dress suitable to make it in. On a recent trip back to Hastings I finally scored this dress in the Oxfam shop for £3.50. It's a light-weight jersey, so this skirt will be more for summer use. As suggested in Gertie Sews Vintage Casual, where the basis for this pattern from, I tacked the skirt together first to check the fit before I stitched the side seams, which is something I almost never do. It's amazing how different knits can produce such different fits, and this light jersey needed to be taken in a lot to achieve a fit similar to that of my ponte de roma versions. What about you? 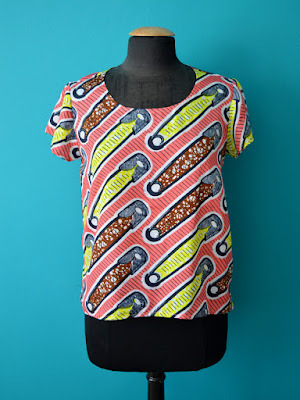 Have you done any refashioning or remaking recently? What do you like and dislike about it, as opposed to starting a project with a piece of fabric? 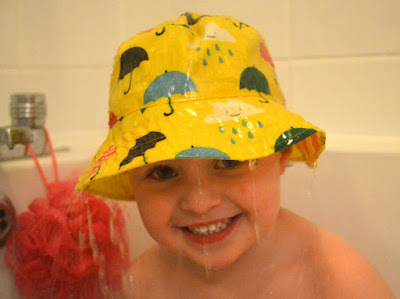 Well no one could accuse me of not trying to get my money's worth from the free Oliver + S children's bucket hat pattern! Rather than simply keeping the sun off, I figured it could also be used to keep the rain (or shower water!) off too. I used the size medium (approx. 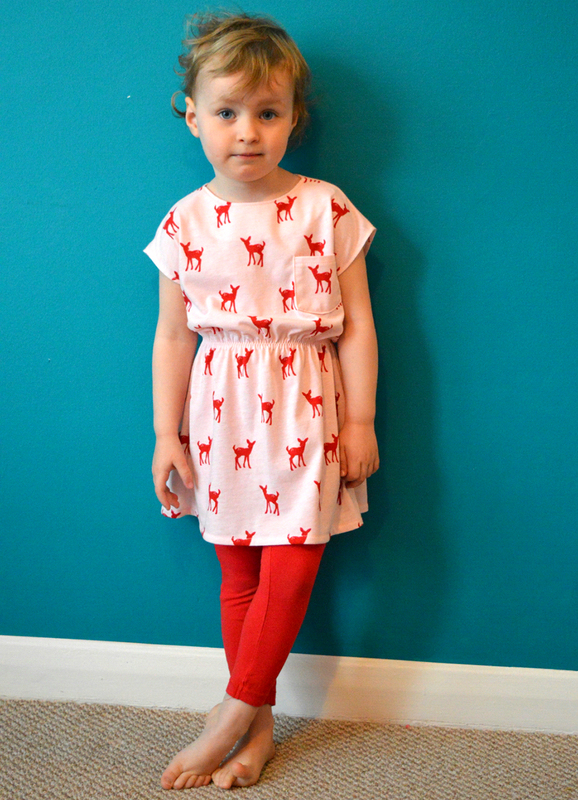 age 3-5) and made no alterations to the pattern. You can read more of my experience of and thoughts on this pattern here when I made using cotton, and also over here where I used it to refashion some unwanted jeans. I fully intend to use this pattern many more times; not only is it a satisfyingly quick make and a great scrap buster, it also produces a genuinely useful item. I can vouch for that, Dolores used her denim one almost every day for several months last summer. 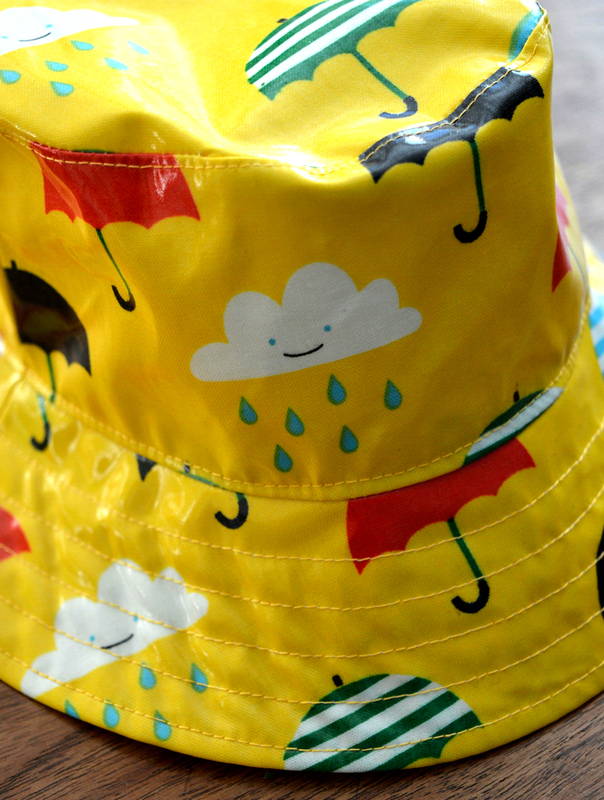 I'm a big fan of Rae Hoekstra of Made by Rae and all her designing output. Her fabric print designs for Cloud9 fabrics are amazing, especially for kid's wear IMO. I was lucky enough to be given a piece of needle cord from her Small World Cloud9 range which I used to make Dolores this dress. about 18 months ago. It remains one of my very favourite makes and never fails to elicit some compliments when she wears it. But as you may know by now, I try to use my stashed fabric and secondhand textiles in most of my sewing projects, however I love that all Cloud9 fabrics certified organic, and ensure ethical and ecological practices have been reached at every step of the fabric production, not just during the growth of the cotton plant, so didn't feel particularly guilty for buying this piece of Cloud9 laminate called 'Signin' in the Rain'. Although this fabric is laminated, it doesn't feel any thicker than a heavier-weight quilting cotton. Whilst using it I didn't treat it particularly differently than regular cotton, except for making sure all pins went through the seam allowance to avoid any pin pricks in the finished item, and using a pressing cloths and wool heat setting when pressing the seams. I didn't even bother getting out the walking foot for my sewing machine, but I did lower the foot pressure to help it go through evenly. Such a fun project, both to make and to see in action as a finished item. My only gripe is that I didn't take a very holistic approach in regards to what bits of the print I used for what pattern pieces when I was cutting it out. Therefore the same bits of print are repeated a bit too closely than I would have preferred, but that's something to learn from for future projects I guess. 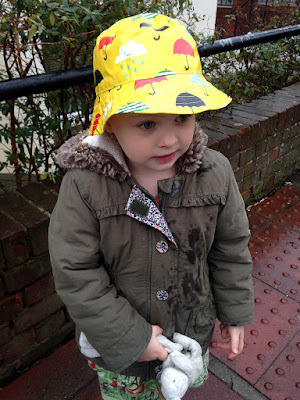 It's great to have on hand, as I often find that the hoods on children's coats are designed more for appearance than practicality, and tend to blow off her head in any kind of wind. Finally!!!! I got to make a garment for myself that isn't directly linked to being pregnant or breastfeeding. It feels like it's been a long time coming and I'm super excited. 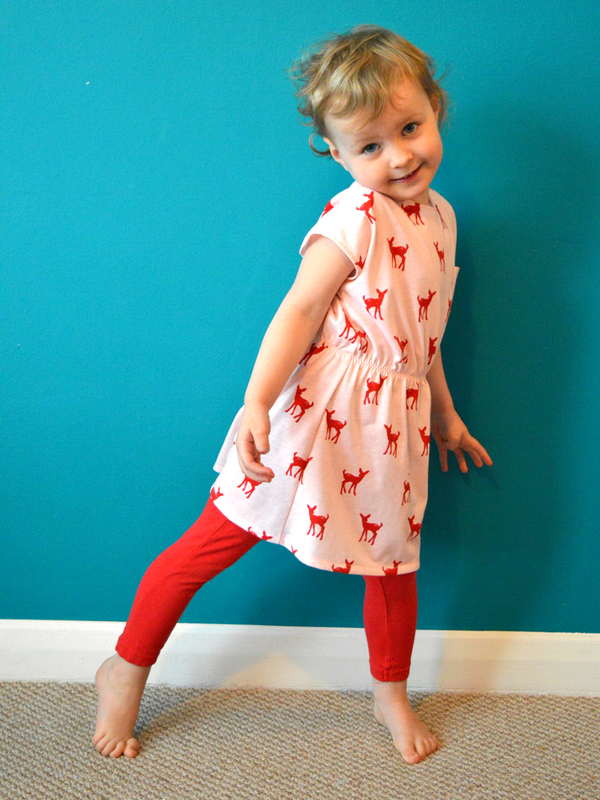 You couldn't accuse me of being an early adopter when it comes to trying out new sewing patterns! This is the Scout tee pattern by Grainline Studio, and it took seeing a lot of other versions (as well as teaching a sewing class with this pattern twice at Fabric Godmother!) to decide that it might be for me. It's a relatively quick project, which suits the fact that my opportunities to sew are currently greatly limited. Even though it's a quick project, I wanted to make sure that my sewing time wouldn't be wasted so I made a toile (muslin) first to check I would be happy with the fit. I'd heard that this pattern comes up a bit big so I picked a whole size down (size 6) than my measurements would have indicated I make, and the sizing ended up spot on. This is quite a boxy style, so I wanted to use a lightweight fabric so that the result wouldn't end up looking too stiff and weird. This African wax fabric is very fine with a loose weave, and was a gift from a friend of mine around the time I had my daughter. My mate was intending to make something for me from it, but her project didn't work out so she just gave me the fabric instead! 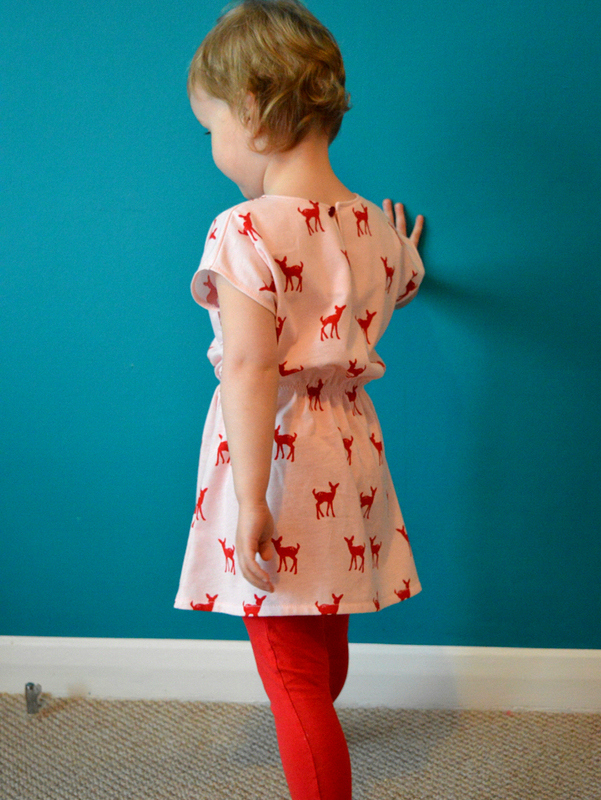 Because the fabric is so fine, and because it feels pretty fancy, I used French seams for the shoulder and side seams. After a few wears the fabric is being pulled apart a bit at the side seams, probably because I yank it up fairly regularly for 'access' to feed my son, so I don't think this top'll last forever. If I were being picky, I'd say that the sleeve heads sit slightly too far off my shoulders. But my concern is that if I were adjust that in this or future versions, I would struggle to get this top on and off as it doesn't have any fastenings. Aside from that, I think the fit is great and it marks a step towards some new style influences that have been occupying my brain (and Pinterest boards!) recently. I think the fabric and pattern pairing is a good one, as it feels so light and breezy on. I wish I'd had some of these when I lived in Spain, but then my preferred silhouette was more fitted back then.